- CMC has provided a high quality service for 25 years to over 10,000 customers across the UK. - 30 Users across 1 site, with indoor and outdoor workspaces. CMC Motors required a solution that would allow staff to move around the full site including the outside forecourt, without any loss in call connection/ coverage. It became necessary to introduce a more modern telecoms solution to replace their old Aastra phone system, which had become unreliable and had reached its end of life. The car dealership needed a solution which would allow them to answer calls seamlessly in their services and parts department, showroom, and outside forecourt with equal call quality. 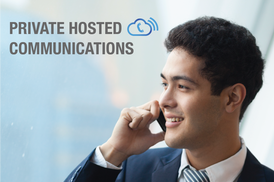 We updated CMC’s old, onsite telephone system to a new private hosted solution. We strategically positioned multiple Snom M700 Base Stations around the site to supply a consistent signal to the new handsets anywhere on the site, including the outside forecourts without any interuption to call quality. ​Team members can now receive calls through their existing direct dial number to their new Cisco deskphone handset, Snom M700 cordless handset or 3CX mobile app providing seamless, integrated communications, whether they are on or off site. Direct dial calls are easily recognised, making it quicker and easier to transfer and prioritise calls. Employees can also use the automatic call recording feature to re-verify any information after a call which has been especially useful in the service and parts department. On hold messaging has created engaging content to fill any gaps within call queues and to encourage callers to stay on the line while the appropriate member of staff becomes available. ​It has given CMC a reliable and professional first impression and has the potential to further enhance business through supporting existing promotions and creating endless cross-marketing opportunities.